Early man was perfectly at home on land. But water and air remained hostile. Water could not hold him back where it was shallow. He just waded across. But he was scared to take on rivers in spate or lakes and seas. It took him quite some time to learn to swim. By flexing his limbs, he stayed above water and steered himself across. But this was tiring. He watched logs of wood floating in water. That gave him an idea. He sat atop a log. It stayed afloat. He rode a log and forded a river in spate. It was easy. It did not tire him out. Thrilled by that experience, he shaped logs into small canoes. Canoes gave him room to sit and work the oars. He made boats of wood or reeds and sailed the high seas. Then came ships that sailed by wind power. Soon mo­tor boats and steamships took man across high seas. Water didn’t limit his movements any longer. Man watched birds in flight. "If only I could be as deft as birds, wing my way to where I want to go!" he wished. Man studied birds. Many facts came to light. He made a note of them: "Every bird has wings. It flaps the wings and flies up or down. The kite flaps its wings, soars to great heights, spreads its wings, stops flapping them and glides gracefully". His studies gave wings to his imagination. He shaped angels after the human form, and lent them wings. For he believed that wings held magical powers. Those with wings could fly. Greek mythology tells us of Bellerphon. He rode Pegasus, the winged horse, and flew toward Mount Olym­pus, the abode of gods. This place was out of bounds for man. But Bellerphon ignored the rule. Zeus, the Greek god, sent shafts of lightning. Pegasus lost its wings and thus its ability to fly. It crashed to the earth, taking Bellerphon to his doom. He became lame and blind and wandered aim­lessly till death. Another tale tells us of Daedalus, a great inventor and engineer and a favourite of King Minos. But no one remains a favourite at court, forever. The King took offence, at a few casual comments of Daedalus, and sent him and his son Icarus into exile in the Island of Crete. Daedalus gathered feathers and used wax to glue the feathers together. He pre­pared two pairs of wings, one pair for himself and another pair for his son. He warned his son not to fly too high since the wax would melt in the sun’s heat. The feathers would drop off, the wings would be damaged and flight would become impossible. The two took off. Icarus kept right behind his father, for some distance. Then he let caution to the wind, dipped and rolled, had fun time. How high could he fly? He wanted to find out. He soared, higher and higher, and got closer to the sun. The wax melted. The feathers flew off and Icarus crashed to his death. In Indian mythology, Ravana abducts Sita in the Pushpak Viman. We think of it as a flying chariot. In the fa­mous work, Arabian Nights, there is the reference to the fly­ing carpet. These tales have their roots in man’s desire to fly. Wings held the key to flying, man concluded. He worked on this idea. Giovanni Battista Danti. In 1530, he tried to fly with wings, but came down a cropper. He paid for his misadventure with his life. Men like Elmer and Danti didn’t know that wings, per se, don’t give one the power to fly. He needs matching muscle power to lift him in the air and to flap the wings to keep him in flight. Scientists now know that no animal has that much muscle power. Leonardo da Vinci, the famous artist, was an innova­tor too. He too wanted to fly. But he was not foolhardy. He noticed that objects, heavier than air, flew for very short duration. But gravity slowed them down and forced them to the earth. He studied the design of the boomerang used by the aborigines of Australia. He read about gliders, popu­lar in China. He watched birds in flight. Slight movement of the wing or tail helped eagles glide in space on air cur­rents without flapping the wings. Da Vinci sat down and drew pictures of wings and tails of various birds. He de­signed a birdlike flying machine. Can a machine take off verticall? He tried the airscrew machine, which is the forerunner of the helicopter. He tested the design of a parachute. Heavy objects drifted slowly to the earth when held by strings, above which spread huge cano­pies made of cloth. four globes out of which air had been pumped out to make them lighter. It didn’t fly. But he was on the right track (Fig. 1.1). Man didn’t have enough muscle power to flap the wings fast enough to gain buoyancy. Could machine pro­vide the power needed to fly? Sir George Cayley got a bright idea. "Success in flight would come", he said, "by making a sur­face support a given weight by the application of power to the resist­ance of air" (Fig. 1.2). In 1853, he built a glider. Its wing surface was 200 square feet. It had three pair of wings and a tailpiece. The wings curved more on top than on the bot­tom. (This design was backed by Bernoulli’s principle. An object, with a flat base and a curved top, reduces air pressure on top. This results in upward thrust). Cayley mounted the glider on wheels. It had room for a man. Cayley’s coachman got on to the glider. The glider was pulled fast across a vast open ground. It gained the speed needed to take off. William Henson hailed him ‘The Father of Aviation’. He improved the design of Cayley by adding two pusher propellers and managed a short flight. He dreamed of air travel to Egypt and beyond. That ended as a pipe dream. He moved to America and spent his life advocating further research into aviation. Fig. 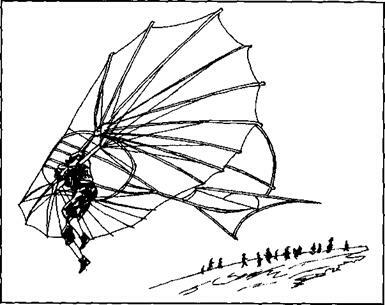 1.4: Otto Lilienthal’s design bears a close resemblence to the hang glider that are popularly used today. didn’t remain stable while taking turns. For that he needed moving wings. Otto Lilienthal (Fig. 1.3) shaped gliders whose wings could be bent and manipulated to maintain stability. He prepared a ‘Flying Hill’ of bricks, about 12 m high, to serve as his launching pad. He said he could fly regardless of wind’s direction. He made over 2000 flights. His flights were photographed (Fig. 1.4). All went well till 9 August 1896. On that day, Otto took off in the glider. He soared into space. Suddenly the air current weakened and the glider lost movement. Otto shifted his weight, hoping to gain support for the glider from the air current. The glider nose-dived. Otto suffered grievous inju­ries and died that night. His last words were: "Sacrifices must be made". In 1896, Samuel Langley made two models. They gained lift with the help of a houseboat steaming down the Potomac River. The models flew well under normal condi­tions. In 1903, Langley built a full-size machine. It had a wingspan of about 15 metres and was powered by a gaso­line engine. Langley tested it twice, once in October and again in December 1903. On both occasions the engine failed. The flying machine was dumped into the river. Langley came very close to success. But success eluded nim. Yet within a few days of Langley’s unsuccessful at­tempts, two young men, Wilbur Wright and Orville Wright, sons of a priest, reached the winning post.